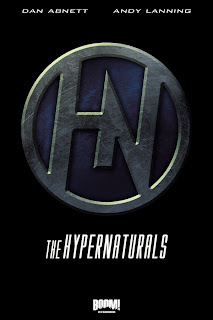 Free Comic Book Day -- Hypernaturals! ... one of the comics you'll be able to pick up for free this Saturday is The Hypernaturals, the new cosmic book Andy and I have created for Boom! We're really excited about this - which we developed at the invitation of the lovely people at Boom! It isn't just new characters we're inventing, it's a whole new universe. If you liked what we did with the Legion at DC, or cosmic books like Nova and the Guardians of the Galaxy at Marvel, you'll love this. The difference is that we can do stories here that we could never do elsewhere. There are always going to be constraints when you're operating inside the marvel Universe or the DCU: stories that just can't work because they clash too badly with established continuity. With The Hypneraturals, we're making our own rules, and they're going to make for some epic stories. We're flattered that Boom! has such faith in this book that they've made it their Free Comic Book Day showcase: it's quite an investment. This isn't an advance print of the first issue, this is a whole sixteen page prologue that we've created especially for the event, and it won't be reprinted in the series (expect to see it in the trade collection). And it's not just sixteen pages of strip either, there's back-up material (a feature we intend to run through the series), helping to build up the universe. There's a preview feature here. Enjoy Free Comic Book Day, and support your local store... and enjoy The Hypernaturals too! The series debuts in July, and we've got some awesome characters and storylines planned for you. BTW - if you pick up your Hypernaturals FCBD issue from your local store, and your local store happens to be The Grinning Demon in Maidstone, tell Graham behind the counter if you want yours put aside for me to sign! Speaking of the Grinning Demon, the convention they ran - DemonCon - was fabulous, and I urge you to attend the next one. It was small but perfectly formed, and I'll write up a report and share a few pics later if I can. Speaking of signings, I'll be posting soon with advance notice of some big ones later in the year (including Canada! ), but for the time being you should know that Graham, Aaron and I will be at the Dublin GW store on Saturday the 26th of May for a mega-signing!